I read this monthly journal about the theory and practice of peer tutoring, and I've not given a lot of thought to how virtual worlds might help. After all, my campus is residential and small. We do not have a widely dispersed student body living off campus, and the interest in virtual worlds hovers between "nil" and "huh?" But not all schools work that way, and I was surprised to see Russell Carpenter's and Megan Griffin's "Exploring Second Life" in the March 2010 issue. I was slow getting to it; you can pick up a free PDF copy of the issue online but it's not easy. Click and then find volume 34, number 7. Their piece came long after the hype cycle for SL had tumbled into Gartner's "Valley of Disillusionment." As I will explain in a forthcoming post, at a recent VWER meeting my assertion went unchallenged when I called SL a "legacy application" in education. SL provides a more "personable" space for interaction with writers than does a 2D conferencing application. Using SL was easy for staff and writers, but building "requires scripting and programming experience along with a great deal of patience." The presence of white boards to display video and other materials offers a unique and immersive experience. The ability to share real estate with other schools lets writing tutors share best practices cheaply. And that last application of SL is the "killer app" to me. It is expensive to get tutors together between schools to share ideas. It also takes a great deal of planning, arranging vans, and coordinating schedules. There's no way to just "go hang out" with peer-tutors elsewhere, and I would love to find a way to get our Writing Consultants more engaged in seeing what occurs at other schools, even observing tutorials within the privacy regulations of FERPA and university-specific policies. At present, I have no clear idea how many writing centers maintain an SL location. A Google search turns up centers for Michigan State , the University of Missouri St. Louis , The University of Central Florida centers. Bowling Green State's center comes up in search, but in reality it closed after a new director, with little interest in SL, took over. The spot not far from our VWER Roundtable venue now houses another project. There may be more. I only hear anecdotes. 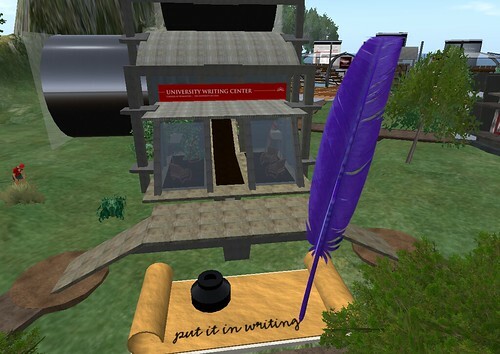 Writing Centers have long been experimenters, but given our lack of professional time and funds, Second Life may be one of those experiments that never quite reached a conclusion.